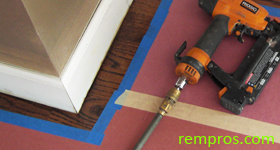 Usually when it is a renovation project and you are changing hardwood, laminate, or even tile floor it is regular procedure to reinstall a baseboards. On a new construction, including home additions it is also a part of finish carpentry work. 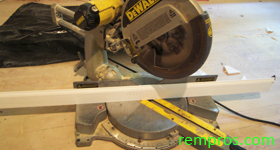 Installation of a baseboard is not as hard as it seems and experiences carpenter can install a new baseboard in a room for a couple hours of work. If you will try to do it by yourself it might takes much longer, but if you have time and proper tools you will definitely save on installation. If you are reinstalling try to buy new baseboard wider than your old one in order to cover unpainted or even unfinished walls behind the old baseboard. Start installation of a baseboard from taking out old baseboard. Cut caulk between wall and old baseboard to avoid damaging the wall while pulling out old baseboard. When it is done – measure the length of a wall and cut exact piece of a new baseboard. Always start baseboard installation from the longest wall. Make 45° cuts for inside and outside corners. If the walls are long connect two or more pieces of baseboard at 45° - it will make connection not that visible. Find the studs behind drywall and nail baseboard to the studs every 16 inches from the top and bottom. If the baseboard will be installed on the bathroom or kitchen wall where it might be water pipes – use shorter nails in order to avoid damaging the pipe. 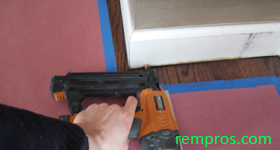 Watch our video to understand better how to install or reinstall baseboard. Should I paint baseboard before or after installation? Whether you are planning to paint or stain baseboard – it is better to do before installation, and after just fill holes after nail gun with wood filler and touch up paint. Note – these are the tips for do it yourselfers a small home renovation projects. During the construction or on big remodeling projects all finish carpentry including baseboards will be painted after installation. Painter will come and patch holes after finish gun, caulk and paint all trims. Also If paint has to be sprayed it should be done after installation. Which nails I should use for nailing baseboard? If you have a regular 5/8” drywall on the walls use 2” long 18 gauge nails. If the baseboard is really thin and drywall 1/2” or 3/8” as well as on the walls with a water pipes use 1 ½” nails. How long does it take to install a baseboard in average 12’ x 12’ room with a closet? If you know how to work with a miter saw and nail gun it shouldn’t take longer than couple hours - may be longer if you will learn how to operate the tools. How much does it cost to install a baseboard? Usually the cost for baseboard installation will vary from $1 to $1.5 per linear feet. But prepare to pay minimum charge for just a couple hours of work. Which baseboard I should buy? Think logically while shopping for a new baseboard. Measure not only the total length you need to buy, but also which length of separate pieces will be the best option. Let say, if you have a few long walls try to buy size of a baseboard which cover the whole length. And do not forget to buy at least 10% more of your actual measurements.